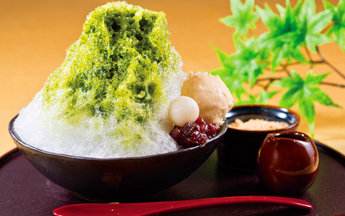 Fancy a fluffy shaved ice dessert in the hot Japanese summer? | Fujita Kanko Inc. Fancy a fluffy shaved ice dessert in the hot Japanese summer? Kakigori is a cool dessert of finely shaved ice topped with strawberry, melon or green tea flavored syrup or sweet boiled beans. 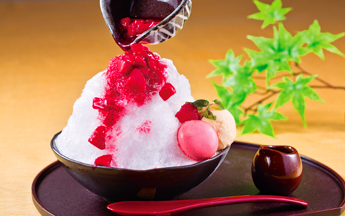 Japanese love eating kakigori in the steaming hot summer to cool down their bodies. 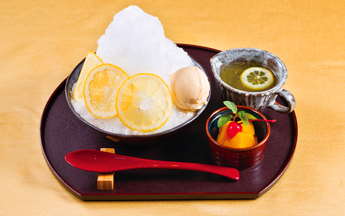 Records of kakigori date back over 1,000 years. In times past, ice was so precious that only nobles had the privilege of relishing this ice dessert. But the development of ice machines in the 19th century made kakigori available to everyone. While the recipe is simple, kakigori is extremely satisfying and deeply rooted in Japanese culture. Not only is it a must-have at summer festivals, but some high-end shops offer kakigori made from natural ice and special house-made jam or syrup as light refreshment. Many Japanese also have ice shaving machines at home dedicated to making kakigori. 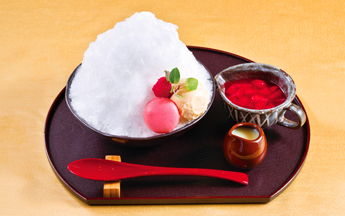 Between July and August every year, Hotel Gracery Shinjuku is delighted to offer three types of specially made kakigori at one of its restaurants. There are also long-established kakigori shops throughout Tokyo where you can explore the flavors of this treasured summer treat.